It’s not every day that you get that response to such a mundane question – and even less so in a London restaurant. But then again, Shaka Zulu is not your everyday restaurant. The restaurant, brainchild of chef Barry Vera and Roger Payne, opened somewhat later than scheduled and to great fanfare in early August. It is far from the first South African restaurant in London – Chakalaka has been open for ages in Putney, Vivat Bacchus has a strong South African flavour to its menu and wine list, and both Nando’s and Spur Steak Ranches seem intent on reverse colonization of the capital – but it at 27,000 square feet it is certainly the biggest and certainly has generated the most column inches in the press. Special permission to use the name Shaka Zulu had been obtained from King Goodwill Zwelethini, the reigning Zulu monarch, and he was flown to London for the opening, only to be interrupted several times during his speech by an (unsurprisingly inebriated) Amy Winehouse. But then that’s Camden for you! I had read divergent views from those who had attended the opening or visited shortly after opening: dark, overdesigned, unique, overpriced, entertaining, good food, bad food. I must admit that none of the above inspired much confidence, especially when combined with the fact that I don’t really like overtly themed restaurants. But I also realized that I was going to have to go, if only to be able to express a coherent opinion the next time I was asked for a South African’s perspective on the restaurant. As luck would have it, Nick spotted a half price offer on the Shaka Zulu tasting menu in one of the South African newspapers in London and so it happened that a couple of weeks ago Nick, the lovely Kavey and I set off to Camden for the Shaka Zulu experience. The restaurant is in the Stables development in Camden and is not particularly well signposted. I spotted mega-restaurant Gilgamesh immediately, but might have walked on had I not spotted the 12ft statue of a Zulu warrior next door. Yes, a 12 foot zulu warrior. Even in Camden, that’s bound to raise a few eyebrows. Much has been written about the vast sums of money spent on the interior (£5.5 million has been bandied about), and I think it’s safe to say that it’s immediately apparent where the money went when you step through the doors. Every inch of the interior is covered in some sort of pan-African décor. The walls and ceiling are all covered (and I do mean covered) in carved wooden scenes: a herd of elephants here, a troop of monkeys here – and each table is topped with decorated and inlaid stone. As you walk through the upstairs bar area gawping, you pass furniture that runs the full gamut from carved chairs with a flavour of Benin, through low sofas covered in colourful embroidered North-African-esque upholstery, to a stone bar striped like a zebra, the likes of which I am 99% positive has never been seen in South Africa. To get to the lower basement where the dining room is, you descend by escalator, stopping only momentarily to stare in open-mouthed wonder at a second 12ft Zulu warrior stationed below said escalator. It’s all great fun but completely bonkers and surreal. Although we were having the tasting menu, We also asked to see the a la carte menu, which includes South African hits such as bobotie, kingklip, chakalaka, sosaties and my favourite skilpaadjies (minced rump steak, liver and kidney wrapped in caul fat and barbecued). Kavey started with a really good cocktail which was not to too sweet and contained pretty sliced kumquats. The wine list is wall to wall South African and I was thrilled to see that they sell Graham Beck sparkling wine by the glass – both the white and the rosé which I had. We started with two items from the starter menu. First up was shraak bread with a cheesy goreme dip/spread and olives; and a bowl of home-made sliced biltong and a spicy dip. The bread was very thin, somewhere between a roti and a tortilla and while it was good warm, it soon turned tough and unappetising in the air-conditoning. The olives were excellent – plump, green and tasty – as was the spiced feta cheese dip dip which reminded me of Greek htipiti. Nothing was remotely South African though. The biltong was certainly South African and, I have to say, surprisingly good: not too dry and correctly salted and spiced. But who on earth decided that biltong needs to be served with a spicy dipping sauce? No self-respecting South African would serve it that way! So although we liked the first two dishes, they were about as genuinely South African as, umm, borscht or Weisswurst. Up next was a fish course – Cape Malay pickled fish. This was truly delightful and authentic. I usually dislike pickled fish that has been tinned or stored in a jar as it loses all sense of texture and just becomes flaccid – but this was lovely, firm fish that indicated that they pickle their own. The pickle was perfect; mildly spiced an vinegary, packed with onions, red chilli slivers and juniper berries. Delightful. As Kavey does not much care for pickled fish, she asked whether she could replace hers with a rooibos tea smoked salmon from the a la carte menu. This was done without any objection and her salmon was indeed lovely with a firm texture and a mild smokiness, but no real hint of Rooibos tea. Still, they were two attractive and delicious dishes. For our meat main course we had 7-hour spit-roasted lamb on spicy chakalaka. The lamb is the black-headed Dorper variety and Shaka Zulu is is the only restaurant in London to serve lamb and beef sourced from the Queen’s Sandringham Estate in Norfolk. The lamb came in four slices and was indeed packed with flavour and meltingly tender as only long, slow cooking can make it. It was served on the spicy chakalaka with its cooking juices and my only complaint was aesthetic – brown meat, in brown sauce, served covering the only element that add a little colour to the plate. So no, it wasn’t pretty, but damn it was tasty. Dessert was the rooibos tea brulee with honeyed oranges. As the waiter had whipped our menus away, we had forgotten the details of this dish and were rather alarmed when we dug our sppons into the bottom of the ramekin and came up with… bits. And liquid. But then we remembered the honeyed oranges – so the bits were meant to be there and damn fine they were too. The texture of the creme brulee was rich and creamy (although you struggled to catch any hint of rooibos flavour) and contrasted nicely with the citrus segments as well as the burnt sugar crust. A winner. After a brief visit to the bathroom (an absolute must as they are delightfully mad with “croc skin” basins and Rousseau-inspired murals), we finished with coffee and a quick nose around the upstairs bar area with its understated (!) zebra-striped polished stone bar. However, when we tried to leave the way we came in, we were directed elsewhere. You see, the main entrance is reached via an escalator from street level, but there is no space for an adjacent up escalator, so you have to walk round to what appears to be the service stairs or fire escape and make your way back to the surface in this most unglamorous fashion. Surely this can’t be their long-term plan for getting customers out of the restaurant? It makes for a decidedly unglitzy end to your evening! Overall, the damages (with one beer, wine or cocktail each and a coffe) came to about £35-£40 each – but this was taking into account the discount on the food. 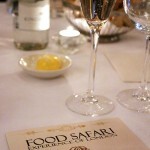 Without discount, the Taste of Africa menu is £48. Which brings me to one of the two sticking points about the restaurant: the price. I understand that the owners have to make back their substantial capital outlay on carvings, statues, escalators and the like, but for the casual diner, it is not a cheap evening out. I also found their pricing erratic – a portion of bobotie (a whole lot of cheap ingredients) costs the same as a portion of kingklip fish (traditionally a premium-priced fish). A cheap evening it ain’t. My other sticking point is that the restaurant is constantly referred to as a “traditional South African restaurant”. Now let me tell you, I lived in South Africa for 30 years and travelled around quite a bit, but no restaurants in South Africa look like this. For my South African readers – it looks as if the guy who designed the Palace of the Lost City was let loose here with a blank cheque and a very loose creative brief. (For my international readers – imagine if there were a Spirit of Africa Hotel on the Strip in Las Vegas – this is what it would look like.) I’m not saying that it does not have a bonkers charm, but at best the decor can be described as ersatz pan-African rather than traditional South African. 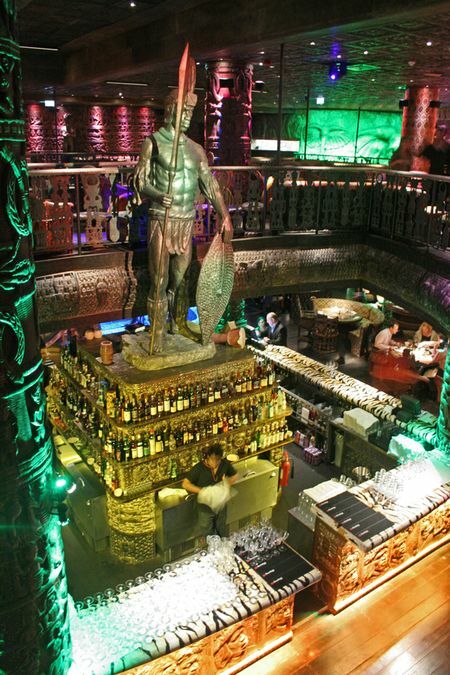 That said, Shaka Zulu certainly is an unusual destination (there is also live African music, or you can come just for a leisurely cocktail) both for homesick South Africans and curious visitors. I probably would go back (even if only to try the skilpaadjies!) but at that price it would have to be for a special occasion – or onsomebody else’s expense account! For a couple more pictures of the night, please see my Shaka Zulu photo album. It sure does not look like a place I would spend money on. A pity if you think how much money it cost to build!! It looks like Vegas in London but is definitely worth the experience wouldn’t you say. I always wonder what these South African Restaurants and SA shops overseas are like and I always imagine that they probably are a bit pricy. This one looks stunning. Sounds great fun even if it isn’t that authentic! Pity Amy Winehouse isn’t on the menu every night!! give me a “sop, kos & pudding place” in SA anytime ! I read a really crap review of SZ recently, from another “PE Girl in London” so I was interested to read your perspective. 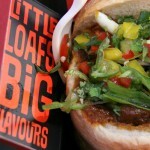 Next time you are in the US, you’ll have to check out 10 Degrees South (http://www.10degreessouth.com/) in Atlanta and let me know what you think! Thanks for a brilliant review… One thing I’d like to know – how many traditional South African cuisine is actually on the menu? sounds and really looks interesting. like something out of a movie kind of gaudy and like you said expensive! I love your honest reviews and you show how it is possible to have good points and bad. The food sounds intriguing but is it worth the price? I would like to taste that crème brulée! Hilarious! I can’t believe that zulu warrior. I must admit I’ve not heard anything positive about the place until now and seriously, spicy dipping sauce! I mean that’s just weird. What an interesting outing! I haven’t been to a ‘theme’ restaurant in yonks! I think the last time was an Amazonion rain forest in the Mall of America…. Anyway, sounds like fun – even if not truly authentic. Great Write up, we went last week and had very similar comments. I would not recommend this restaurant unless you have a coupon!